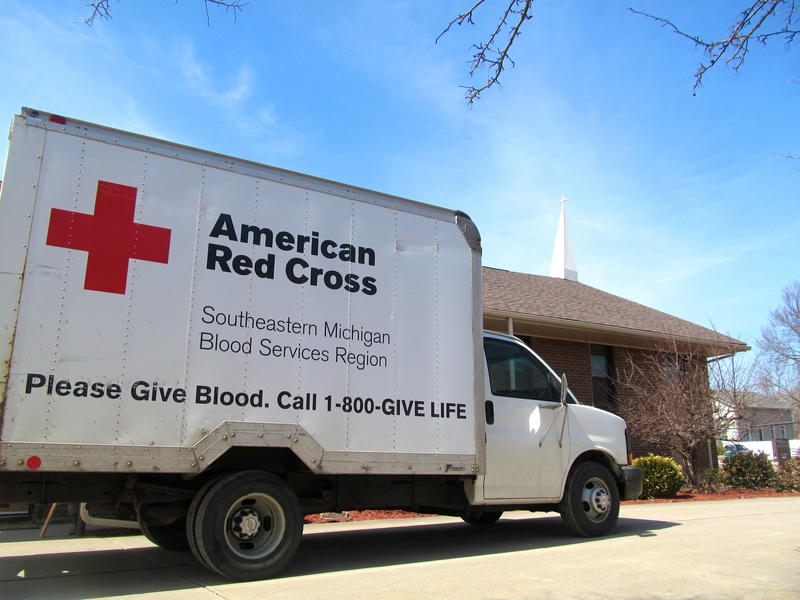 As the sun shines, residents of the Huron community donated 17 productive units of blood during a Red Cross drive at Willow United Methodist Church on Monday, March. 31, 2014. The Huron Township community helped save lives on Monday, March 31. 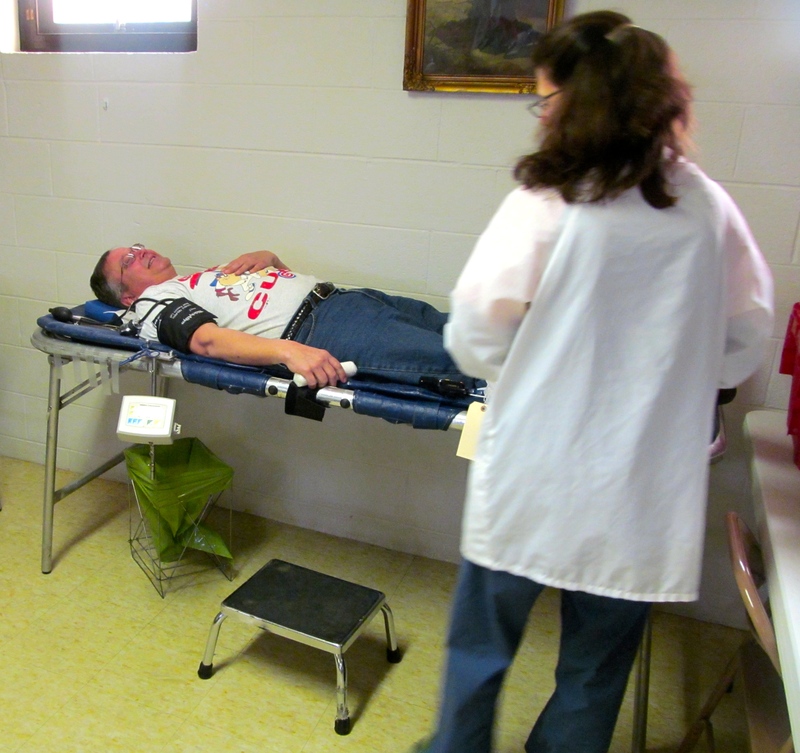 The Red Cross blood drive at Willow United Methodist Church in New Boston collected 17 productive units of blood, according to Red Cross Representative Martha Roemer Kurtz. 23 potential donors came to the drive and helped produce enough blood to potentially save 51 lives. Each productive unit of blood could possibly save three lives, according to Kurtz. “Everyday we need 900 donors to meet supply demand in hospitals across Southeastern Michigan,” said Kurtz. If you’d like to donate blood or find an upcoming Red Cross event, log onto http://www.redcross.org. There, you can search for different events by city or zip code. As a Red Cross technician prepares, Steve Chont of Huron Township was one of over two dozen people to donate blood during the drive. The blood drive was organized by the Huron Township Rotary and sponsored by Inergy, a leading automotive supplier that operates out of New Boston. “We are celebrating the rotary’s 75 years of existence with “12 x 12″: Twelve projects in 12 months,” said Rotary Treasurer Terri Riopelle. According to Riopelle, the Rotary will be organizing a few other events to celebrate their anniversary as we head into the spring and summer. Already in the works is a 2014 Harley Davidson raffle planned for Oct. 5, 2014. For more information on how to sign up for the raffle, visit www.hurontownshiprotary.org. This entry was posted in Community, Front Page News and tagged Downriver, Huron, Huron Charter Township, Huron School District, Huron Township, New Boston, red cross, Southeast Michigan on April 1, 2014 by Scott Bolthouse.